Constantius, his laureate head right. Star in right field, RT in Exergue. 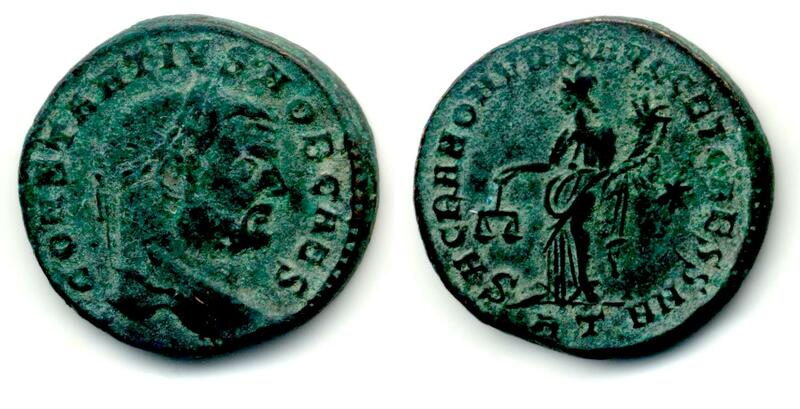 Minted at officina T in Rome in 302 or 303 A.D. during his reign as Caesar under Maximianus. Sutherland, C.H.V., "Roman Imperial Coinage", Volume 6 (RIC), Rome, p362, nr 104a. hinterlassenen Sammlung und Aufzeichnung des Herrn Paul Gerin" (Voetter-Gerin), Roma, Constantius Chlorus, p220, nr 27. Van Meter, D., "Handbook of Roman Imperial Coins", p280, nr 28. The coin still has the original green patina which is typical of coins from the Northern Sinai Hoard..
(1) = Cathy E. King & Arnold Spaer, "A Hoard of Folles from Northern Sinai", Numismatic Chronicle, 1977, p66. See my page on "My folles from the Northern Sinai Hoard"